200 employees of the Northeast region of United Healthcare came together in Cambridge, Maryland, for an Ace Race Team Building Event. The opportunity was a great experience for team building, fun, friendly competition, and to donate food to a local food pantry. 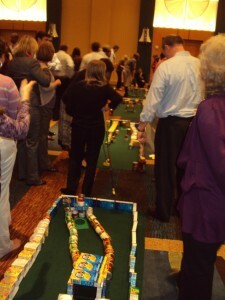 Everyone had fun designing a miniature golf hole and then competing to make an “Ace” (hole-in-one) at each hole. The courses consisted of 2 nine hole courses and 1 six hole course, each with mats of felt for the green and non-perishable food items to construct the holes and obstacles. Each hole provided a challenge and fun to all of the participants. The fun and learning culminated in all of the food items being donated to the food pantry that gladly received the donation. There was learning, fun and a great feeling at the end of the event. 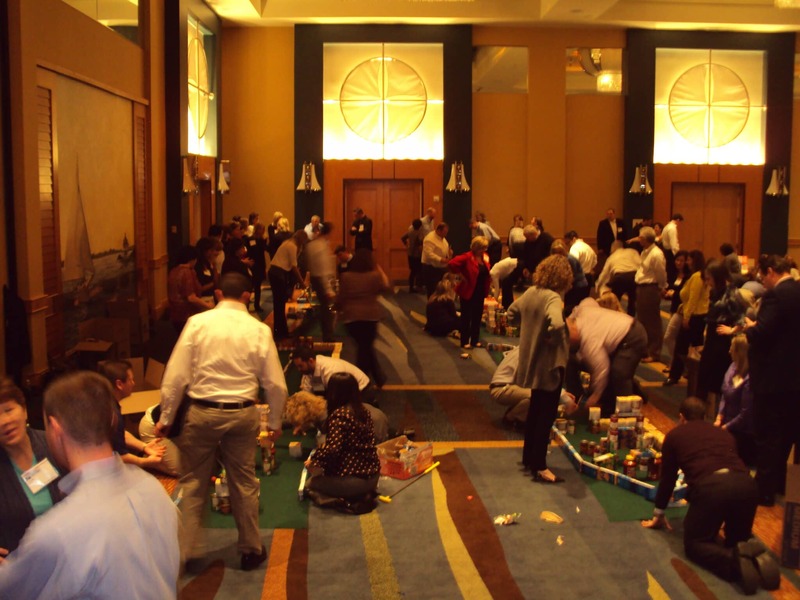 The Ace Race Team Building Event is a fun way to teach some basic team building principles while having fun and giving back to the community. The teams were formed randomly but each team had to use the experience and talents of the members to complete the tasks. Some people are good at the design of the golf holes, others have the ability to put the parts together in a specific order to construct the holes: others have the ability to hit the golf ball and make the critical shot; still others are able to organize the individuals to get the best from each one. The best teams are those that recognize how each individual can contribute to the team and then cheers them on to make significant contributions.